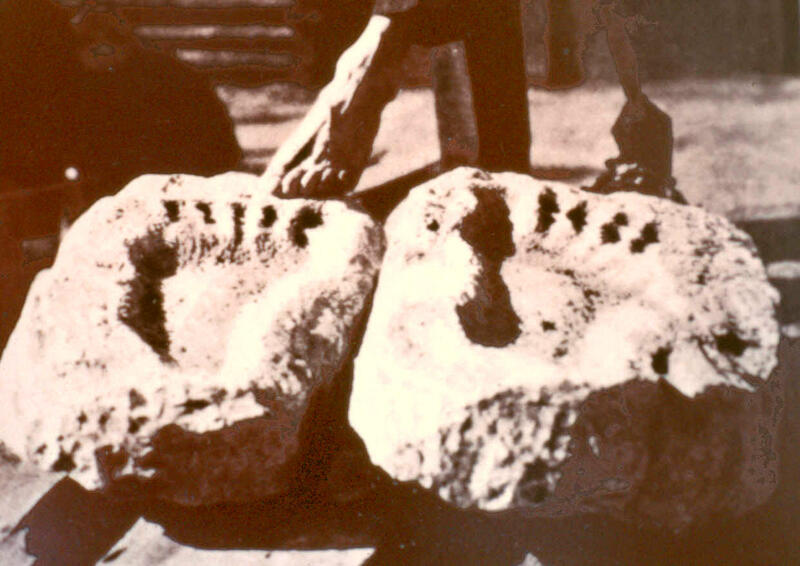 In 1802, a twelve-year-old farm boy named Pliny Moody found an unusual object while plowing a field in South Hadley, Massachusetts—a big, flat stone bearing what appeared to be footprints of large birds, which some are said to have attributed to “Noah’s raven.” For decades they drew no scientific attention, but in 1835 a local stonemason, Dexter Marsh, noticed similar marks on a flag stone he had set aside for use in a sidewalk he was building near his house in nearby Greenfield. Others also saw them, including a physician, James Deane, who wrote to geologist Edward Hitchcock of Amherst College, describing what he called “the tracks of a turkey in relief” (Hitchcock, Reminiscences of Amherst College, cited below, p. 82). composed of a fine blue mud, such as is now common in ponds and estuaries; and where the bird trod upon it, in some cases, it seems that the mud was crowded upwards, forming a ridge around the track in front, several inches in height. Indeed, I hesitate not to say, that the impression made on the mud appears to have been almost as deep, indicating a pressure almost as great, as if an Elephant had passed over it. I could not persuade myself, until the evidence became perfectly irresistible, that I was examining merely the track of a bird (“Ornithichnology,” cited below, p. 319). Basically, Hitchcock founded what he often called “ichnology,” or (in his own words) “the science of tracks,” though the term itself was “proposed by Dr. [William] Buckland” (Edward Hitchcock and Charles H. Hitchcock, Elementary Geology, 1863 edition, pp. 243-44). His personal “cabinet” of specimens, many of which he dug out of quarries himself, very favorably impressed Charles Lyell when he visited Hitchcock in 1842. It remains the heart of the largest collection of dinosaur tracks in the world, at the Beneski Museum of Natural History at Amherst College. Photograph by Edward B. Davis. 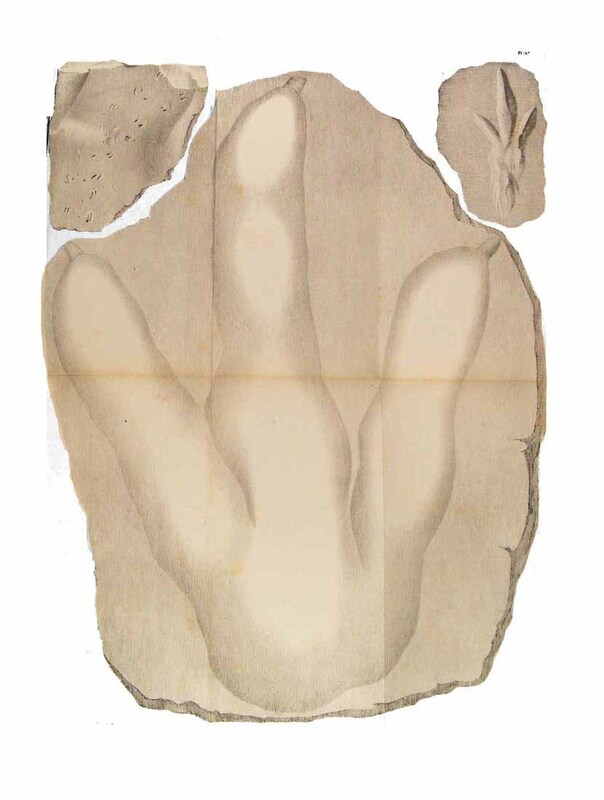 This fold-out plate of what Hitchcock called “Ornithicnites giganteus,” or giant stony bird tracks, accompanies Hitchcock’s article from 1836, cited below. In this full-size copy of a single mark, found in a quarry on Mount Tom, the footprint extends 14½ inches from the heel to the tip of the central toe and 10 inches wide—a very impressive display indeed. It was immediately reprinted in Europe (in the second volume of William Buckland’s Bridgewater treatise), marking an early instance of science flowing from the new world to the old, rather than vice versa. To the best of my knowledge, the first image of a dinosaur footprint had been published just five years earlier, in an article by the Scottish minister, Henry Duncan, in the Transactions of the Royal Society of Edinburgh—an article that Hitchcock cited. “Providence first struck down my ability to study … and thus by cutting off my worldly prospects led me to inquire on what foundation I was building for eternity, and a prayerful study of the inspired volume forced me to give up inch by inch the ground on which I tried to stand and brought me into the belief which became cordial as soon as I understood it, of the plain old-fashioned doctrines of the Puritans” (Reminiscences of Amherst College, p. 283). Soon he became preceptor of Deerfield Academy, where he had attended himself, despite his lack of college training. Two years later, at age 25, he left that post to study theology at Yale, where he also attended Silliman’s lectures on chemistry and geology, off and on, for several years. His relationship with Silliman actually began while he was still at Deerfield. Sending Silliman a box of minerals he had collected, he solicited help with identifying them. “I promptly complied with the request,” Silliman wrote more than forty years later, “and as the accompanying letter of Mr. Hitchcock was written with modest good sense, and indicated a love of knowledge, I invited him to send me another box…” Hitchcock accepted Silliman’s invitation to visit New Haven, “and for a series of years he was often here, and attended all of the courses of lectures with more or less of regularity” (Life of Benjamin Silliman, cited below, vol. 1, p. 302). Reproduced with permission of Amherst College. President Edward Hitchcock Returning from a Journey (ca. 1838). Oil on canvas attributed to Robert Peckham. Collection of Mead Art Museum, Amherst College, Amherst, Massachusetts. Gift of Lucy and Caroline Hitchcock. P.1940.1. Reproduced with permission of Amherst College; image source. Hitchcock greets his family, including his wife, Orra White Hitchcock (in a brown dress), a gifted amateur artist whose botanical and geological images enhanced her husband’s books and lectures. Although he was ordained a Congregationalist pastor in 1821, ill health forced his church in Conway, Massachusetts, to dismiss him four years later. After further study with Silliman, he was appointed Professor of Chemistry and Natural History—a standard combination then—at Amherst College. Twenty years later in 1845, he was named President and Professor of Natural Theology and Geology. The change in titles indicates the importance of Christianity both to the man and to the institution that placed him at the reigns. Among his many other accomplishments, Hitchcock served as official geologist for the states of Massachusetts (writing the first such report to be published anywhere in the nation) and Vermont, was the first president of the Association of American Geologists (which gave birth to the AAAS), and was voted a charter member of the National Academy of Sciences two years before his death. He also wrote Elementary Geology (1840), an enormously successful textbook that replaced Silliman’s editions of Bakewell’s British book and was still in print as late as 1879. It contained a full chapter about the connections between geology and Christian beliefs that will be discussed in subsequent columns. An outspoken advocate of higher education for women, he admired Mary Somerville and wrote a laudatory book about Mary Lyon, the founder of nearby Mount Holyoke Female Seminary (now Mount Holyoke College), where he often lectured to the students. No one can examine existing nature without being convinced that all its parts and operations belong to one great system. Geology makes other economies of wide extent to pass before us, opening a vista indefinitely backward into the hoary past; and it is gratifying to witness that same unity of design pervading all preceding periods of the world’s history, linking the whole into one mighty scheme, worthy its infinite Contriver. How much, also, does this science enlarge our conceptions of the plans and operations of Jehovah! We had been accustomed to limit our views of the creative agency of God to the few thousand years of man’s existence, and to anticipate the destruction of the material universe in a few thousand years more. But geology makes the period of man’s existence on the globe only one short link of a chain of revolutions which preceded his existence, and which reaches forward immeasurably far into the future. We see the same matter in the hands of infinite wisdom, and by means of the great conservative principle of chemical change, passing through a multitude of stupendous revolutions, sustaining countless and varied forms of organic life, and presenting an almost illimitable panorama of the plans of an infinite God (pp. 482-83). According to an anonymous reviewer in The Bibliotheca Sacra, then as now a bastion of conservative evangelicalism, it was just this passage that “led the Rev. Dr. Lyon, of Columbus, Mississippi, to make efforts to have one [professorship] endowed at Columbia, South Carolina.” This was none other than the Perkins Professorship that Monte Hampton told us about not long ago—a professorship that no longer exists. “We hope the example may be followed by other liberal minded men of means,” the reviewer added, “until all our theological seminaries are supplied with such professorships.” (“The Religion of Geology,” Bibliotheca Sacra, vol. 17, Oct 1860, p. 676) If only things had turned out that way! More than a century and a half later, endowed chairs devoted to science and religion (let alone natural theology), either at seminaries or Christian colleges, are still thin on the ground. The Infidel rages furiously because I have endeavoured to make geology sustain and illustrate revelation; but my Christian friend declares my book to be thoroughly Infidel. One of the parties must surely be mistaken in its bearings. Till they can settle that question, I think I may rest quietly. Like an acid and an alkali in chemistry, the two attacks neutralise each other, and leave me unharmed. Sitting in my comfortable office, overlooking a quiet campus about to be inundated with eager seekers for truth (and others), I can almost hear the same voices amidst the silence in which I have been resting so quietly. That’s exactly why BioLogos exists, but you probably knew that already. 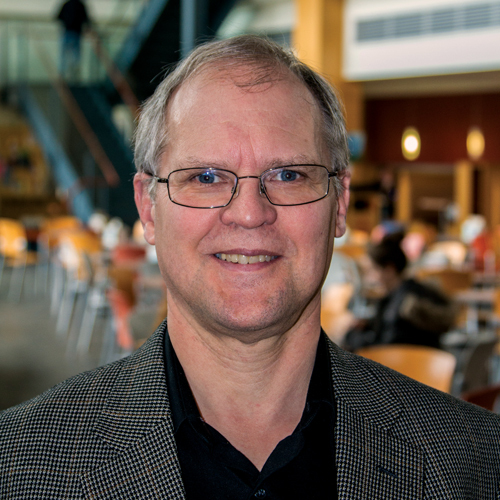 Ted Davis is Professor of the History of Science at Messiah College and author of the fascinating Reading the Book of Nature blog for the BioLogos Foundation.